Composed by Claude Debussy (1862-1918). Arranged by Kenneth Abeling﻿. 20th Century, Impressionistic, Children's Music. Score, Set of Parts. 13 pages. Published by LINCOLN MUSIC PUBLICATIONS (S0.295793). 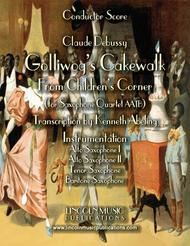 This is Golliwog’s Cakewalk from Children’s Corner suite by Claude Debussy transcribed here for Saxophone Quartet. This “Rag Time” style piece with its emotional rubato sections is fun to both play and listen. This is an advanced intermediate to easy advanced transcription. Playing time: 2:50. To view and listen to this piece in its entirety as well hundreds of other arrangement and transcriptions by Kenneth Abeling at the lowest prices available please visit: www.lincolnmusicpublications.com.